Prepare vinaigrette by whisking reserved citrus juice in bowl with mustard. Gradually add enough oil, whisking constantly, until dressing is creamy; add salt and pepper to taste. Prepare salad by placing greens evenly on each of four serving plates. Top greens artfully with tomato pieces, avocado pieces, fruit segments. Gently spoon tuna pieces over salad, and drizzle with vinaigrette. Sprinkle with salt and pepper and almonds to serve, or place almonds around salad on plate as garnish. Pass any reserved vinaigrette at table if desired. Happy beautiful August Saturday everyone! 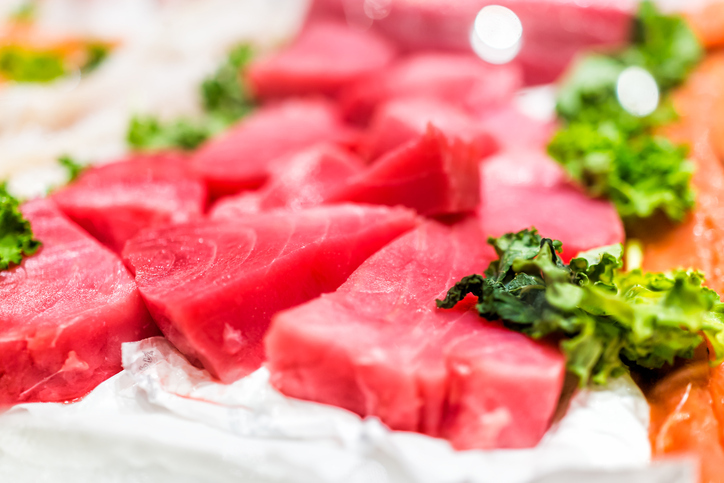 My quick post for this week includes how to make a sublime cool salad that is made with sashimi-quality ahi tuna, fresh tomatoes, avocado, and citrus. Some sprinkled almonds on the side gives this dish a fantastic Mediterranean twist and makes it the perfect summer small plate! In the photo are ahi tuna cubes that may be purchased from a good Asian or gourmet grocery store, packaged this way. 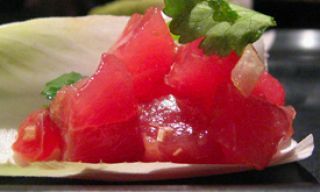 Or, you may simply buy the raw tuna by the ounce/pound, and slice it or cube it yourself. The photo here is simply a snapshot to show what is a great poster child this ingredient is, for summer plates! Enjoy this delicious warm-weather refresher made with delicious tuna!